Do your neighbors love the same labels as you? Business.org researched the favorite brands of each state in the US, and your home’s tastes may surprise you. You know the brand of shoes you put on this morning. You’re aware of the company that made the car you drove to work, as well as the label on the coffee you grabbed at the drive-thru. You definitely know the brand of the phone you might be reading this on right now, and you’re fiercely loyal to that snack fruit (or, to a lesser extent, robot) logo. We may not give brands much thought, but we all have our favorites. They’re an intrinsic part of our everyday lives, which is exactly the companies’ intention: most people would sooner give up a child than their iPhone. Admittedly, that’s a stretch—but what has little Tanner done for you lately? Brands are powerful, and they can make a business just as easily as they can break them. Nike famously took what looked like an insane PR chance—to industry insiders, anyway—on controversial NFL star Colin Kaepernick, and it paid off big in brand engagement, if not sales. Meanwhile, companies like Target and Volkswagen are still in recovery mode from public hits taken in recent years, and Papa John’s has taken a deep-dish dive thanks to, coincidentally, criticism of Kaepernick and the NFL. 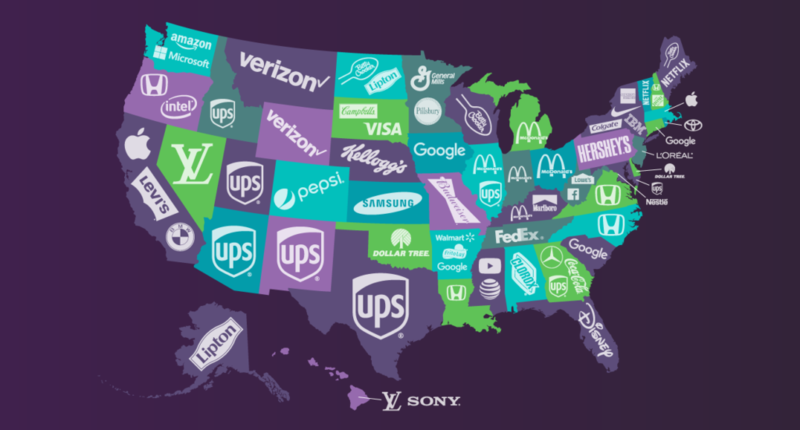 Business.org decided to look at the more fun side of label loyalty, asking, What’s the most popular brand in each state of the US? First, we cross-referenced Forbes’s 2018 “World’s Most Valuable Brands” with Morning Consult’s “America’s Most Loved Brands 2018” to compile our initial index of brands and gauge geographical love and indifference. Then we ran those brands through a super-secret, highly classified data analysis system—OK, we used Google Trends—to determine each state’s favorite brand. Like it or not, brands are linked to our lives and, sometimes, our identities. Maybe you’re not going to get a Doughboy tattoo to receive a lifetime supply of Toaster Strudel, but some Pillsbury fans in Minnesota might seriously consider it (note: Pillsbury is not making any such offer, Minnesotans). Besides Minnesota’s sugary affinity for Pillsbury and General Mills, we ran across regional data points during our research ranging from completely logical to utterly bizarre. Florida’s favorite brand is Disney, which makes sense, as it’s home to Disney World. Likewise, Washington loves home-state companies Amazon and Microsoft, Pennsylvania has a taste for its own Hershey’s, and California is very much into a little Cupertino startup called Apple. Since New York is the center of the universe—ask any New Yorker—it’s apparently entitled to a four-way tie between American Express, Colgate, IBM, and Nike. These are NY-based brands, with the exception of Nike, which came in only second in its own state of Oregon. The brand that delivered the most frequent favor was UPS, which topped the lists for eight states: Arizona, Georgia, Idaho, Illinois, Maryland, New Mexico, Texas, and Utah. Maybe they’re placing a lot of Amazon orders and are comforted by the sight of Big Brown coming down the street. McDonald’s appeared nearly as often as UPS, serving up a Quarter Pounder of preference in five states: Illinois, Indiana, Kentucky, Michigan, and Ohio. Particularly interesting (or concerning, health-wise) was Kentucky’s two-way tie between Mickey D’s and tobacco giant Marlboro. Beverages didn’t fare well across the states, with only singular appearances by Coca-Cola (Georgia), Pepsi (Colorado), Lipton (Alaska), and Budweiser (Missouri). Also, Campbell’s Soup only showed up once, in an odd tie with Visa in South Dakota. Is tomato bisque really that expensive up there? Hawaii has upscale tastes, splitting its love between French fashion brand Louis Vuitton and Japanese electronics behemoth Sony. On the more thrifty end of the scale, Delaware and Oklahoma really enjoy their Dollar Tree. Somewhere in between, New Jersey just likes to look good with L’Oréal. Internet titans Google and Facebook are forever battling for your clicks, but our research—aided by Google, full disclosure—shows four Google fave hubs (Arkansas, Connecticut, Iowa, and South Carolina) to Facebook’s one (West Virginia, in a tie with Lowe’s). Sorry, Zuck. Alabama picks Clorox . . . what gives? Either they really love bleach in the Heart of Dixie or the Clorox Company’s sub-brands (which include Pine-Sol, Liquid Plumr, Fresh Step, Glad, Hidden Valley, and Burt’s Bees) also count. Maybe it’s the Clorox Wipes—essential for cleaning up after a barbecue. In business, branding is everything. Once established, brands can coast for decades on loyalty and reputation. While most of the above brands researched by Business.org continuously innovate and update their products to keep their faithful coming back, some remain perfectly static to avoid any potential fan base backlash. Just ask your parents about the “New Coke” crisis of the ’80s. Do you agree with the rest of your state, or are they dead wrong? Let us know your locale and your favorite brands in the comments below.